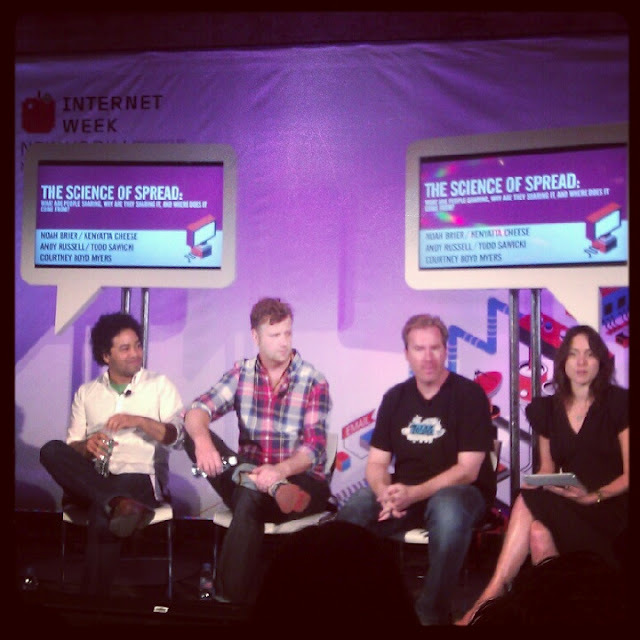 This Internet Week coverage is brought to you by ShareThis. The best content is hand picked. In a lively, amiably contentious, and occasionally absurdist Internet Week panel titled "The Science of Spread: What Are People Sharing, Why Are They Sharing It, And Where Does It Come From," experts in the field dispensed wisdom and opinions on how internet users interact with memes and viral content. Moderated by The Next Web's Courtney Boyd Myers, panelists included Percolate CEO and Co-Founder Noah Brier, Know Your Meme Co-Creator Kenyatta Cheese, Trigger Media CEO Andy Russell and Cheezburger Network CRO TOdd Sawicki. Much of the conversation centered around web communities where users generate much of the content for free. Why do they do this? Panelists offered a number of explanations including the hope of gaining personal acclaim, gaining followers on various social networks or the simple joy of being part of being part of a community larger than oneself, and making the content as a pure labor of love. There was clear consensus, however, on the notion that these communities should not be expected to pass the profits from this free content back to the users; the cash goes toward keeping the sites afloat and paying curators to pull together the best content. The pay-off for users is intangible, save the few artists and writers who are "discovered" through these forums and launch careers, such as the many book deals that have come from Tumblr blogs...or Rebecca Black. The panelists returned several times to the concept of "curators" and "influencers," identifying them as the conceptual descendants of newspaper critics - blogs and bloggers are often now our trusted sources for cultural information, reviews, recommendations, and more. They stressed the importance of not confusing "reach" with "influence," however - a site with millions of pageviews can be far less valuable than a local columnist, if that columnist has a devoted following and a good track record of recommendations. True influence is the result of trust. From there, the conversation took a surrealist twist, when Kenyatta Cheese introduced Toxoplasmosis - a disease affecting pregnant women, contracted through cat droppings - as a metaphor for memes. The panel debated the possibility that much like we often see in the animal kingdom, "viral" content has a mind of its own, so to speak, and bends the behavior of internet-users to its will. Put more realistically, the panel raised interesting questions about whether cultural memes affect our behavior - how much control we have over content, and how much control it exerts over us without our knowing. In a closing note relevant to brands, Noah Brier pointed out the key point of failure for many brands trying to establish a social media presence and create (or curate) viral content: it is a failure to listen. If companies really want to become trusted influencers, they need to think outside the box to find and create content relevant to their consumers. Over time, this steady flow of relevant and useful sharing aids in cementing brand identity, and forming relationships with customers. It remains true that there is no formula for virality. This panel asks us to think, however, about steps one can take to build influence bit by bit, and whether that might be more valuable anyway. This guest post was written by Dinah Finkelstein of Catch 24 Advertising & Design. This Internet Week coverage has been brought to you by ShareThis. Socializing the web one share at a time.